Calculus is made to be a whole big hoopla in high school and first year university. It’s supposedly the hardest math class in high school, notoriously complicated and unintuitive. I blame this on bad education, not just because I’ve observed so much bad math education at the high school level, but because I can’t see any other way anyone could conclude that calculus is difficult. Because I believe that everyone already knows calculus. They just never connect what they already know to the symbols they’re manipulating in math class. So what is calculus? It’s the mathematical study of rates of change, nothing more and nothing less. We call the rate of change of a function its derivative. The fact of the matter is that you deal with derivatives all the time. They’re part of the way you think. For example, the speed of your car is the derivative of the distance you’ve traveled and acceleration is the derivative of the speed. A large part of the calculus curriculum is concerned with the “rules of differentiation” which are just a couple of identities regarding derivatives that are useful in calculating them for a function. With the possible exception of one, you already know all of them, though some may take a tiny bit of prodding to draw out. We shall begin with a few rules that you not only know, but intuitively use on a regular basis. Sum rule is an identity for when two functions are added together. 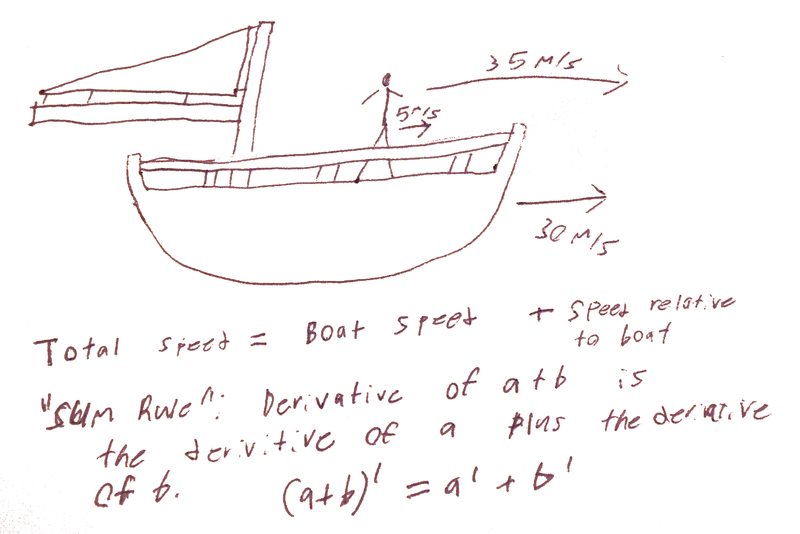 For example, consider a person walking on a boat: their distance from the shore is the distance of the center of the boat from the shore plus the amount they’ve walked away from the shore relative to the mast..
Well, their speed is the speed of the boat plus their speed relative to the boat! Obvious enough, and that’s sum rule. To write it out, we will use the prime notation, with representing the derivative of . Then the sum rule can be stated as . Just don’t let the symbolic version make you forget the real thing! But suppose they’d been walking in the opposite direction. Then their position would have been the distance from the shore to the boat’s mast minus the distance they’ve walked from the mast towards the shore. And obviously their speed would be the speed of the boat minus their relative speed! That’s difference rule: . As another example, consider the amount of water in a bath tub: It’s the amount that has gone in minus the amount that has gone out. 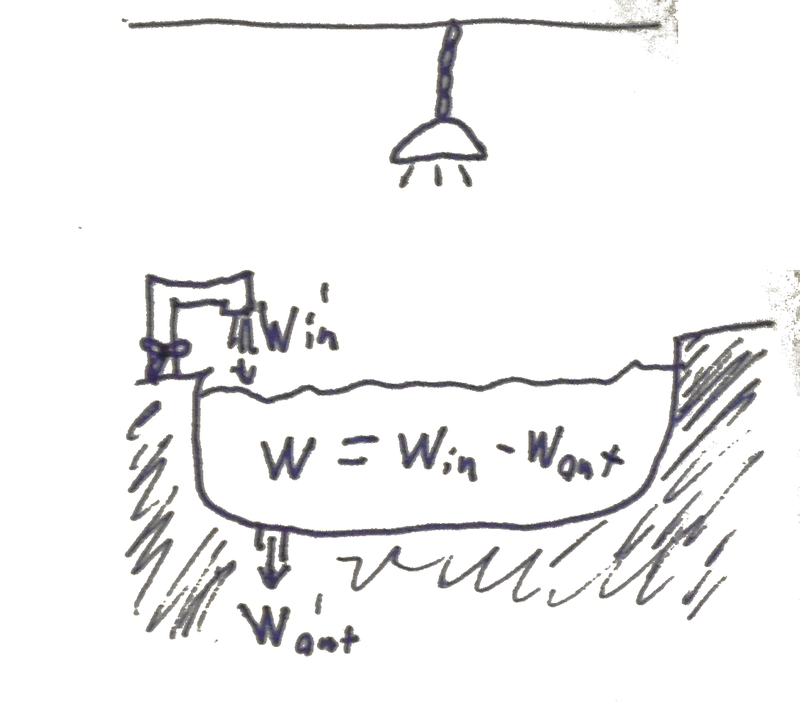 And clearly the derivative of the amount of water in the tub, that is the rate at which the amount of water in the tub is changing, is the rate at which it is entering minus the rate at which it is leaving! Now lets consider a very different scenario. You’re laying back on your couch and watching a movie. A runner dashes through the screen! Now things are slightly tricky because movie time can flow differently than normal time (fastforward, rewind, etc). So at any point in real time t, the movie player is at a certain point in movie time, . Normally video time and real time flow at the same rate — one movie second passes per real second — so the derivative of movie time, , is 1. But when we fastforward, it might be and when we rewind it might be . Now consider our runner friend. Let’s call him Bob. Bob is running at in the movie, and normally that is what we observe him doing as well. But when we hit fastforward he moves (to us) at , even though in movie time he is only going at . That’s perfectly natural, the speed Bob seems to be going at is the speed he moves at in the movie times the rate movie time is passing relative to real time. Let’s try and formalize this a little bit, let Bob’s position be describe by a function . is his position at a point in real time. is Bob’s in-movie speed he at a point in real time. is the rate movie time passes with respect to real time. And, as we agreed, his in-reality speed is those two multiplied: . More generally, the rate at which changes (ie. ) is the rate at which changes at (ie. ) times the rate changes (ie. ). Now, when you were watching Bob, you were fairly into the movie and so you were thinking about his movement in terms of in-movie meters. But now imagine you are somewhat more detached. 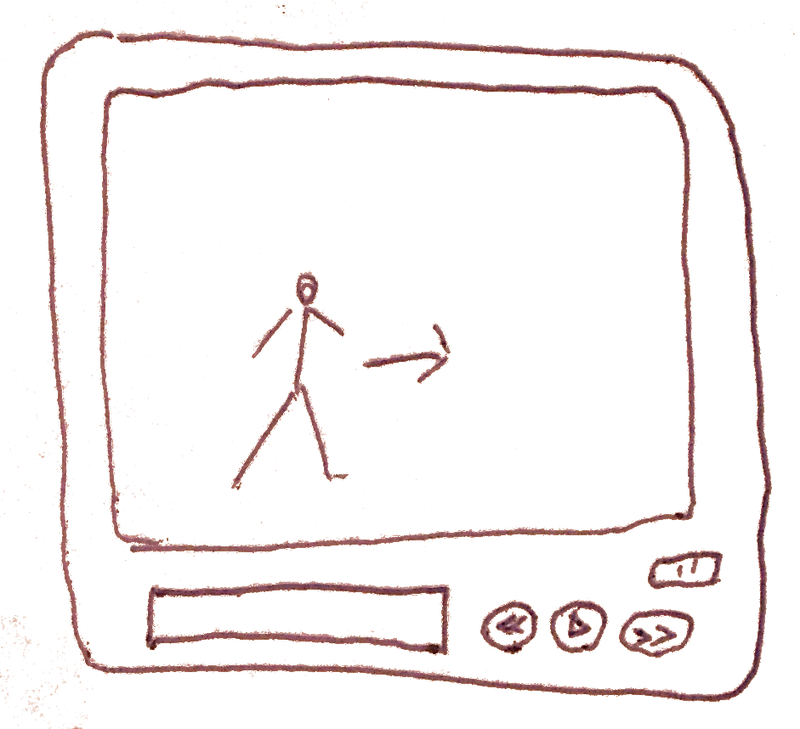 He’s moving across the screen at 2 (real) cm/s. Now you go watch the same scene at your friend Sally’s house because her television screen is twice as big (on both axis, not area! So it’s a massive difference!). And — jolly gosh! — Bob now moves 4 (real) cm/s. Imagine that! This seemingly obvious fact is given the (extremely creative) name ‘constant multiple rule’ and goes . If you multiply a function by a constant amount, you multiply its rate by the same amount. If the world becomes twice as big, everything goes twice as fast! Another question: at what rate does something that doesn’t change change? How fast does a person who is standing still move? If you answered, nada, it wasn’t changing, zero, they didn’t move, zero meters per second or any similar answers, you were correct. The derivative of a constant is zero. That is to say, if is a constant, . This fact is called constant rule, and it is definitely in the running for the most obvious rule of differentiation. Our units are radians, the distance we’ve swept out on the circle. 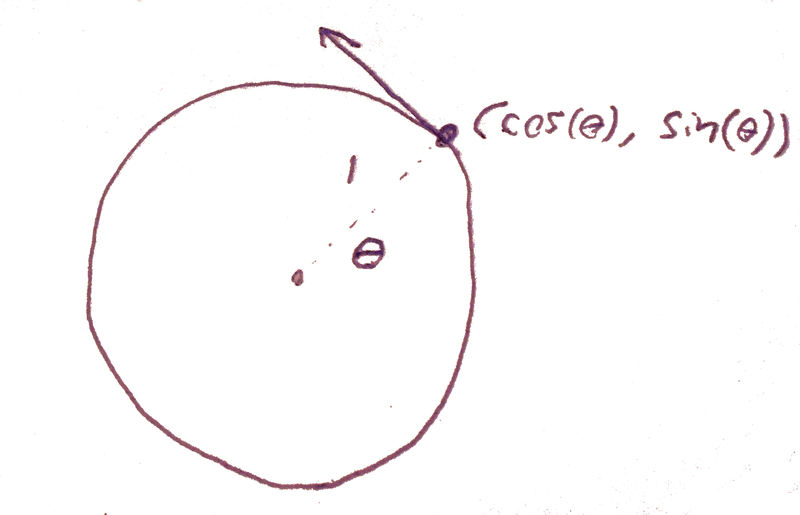 So if we consider our point on the circle as a function of the angle, we’re moving at unit speed. 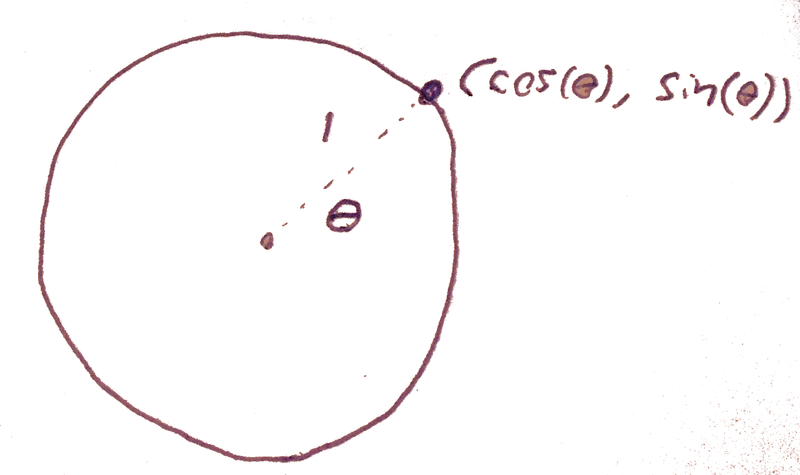 So now, imagine yourself running along the perimeter of a circle with a radius of one meter. You’re going at 1 m/s. At every point, you’re moving tangent to the circle, at a speed of one meter a second. That arrow is the derivative! Imagine moving it so that it’s base was at the center of the circle. 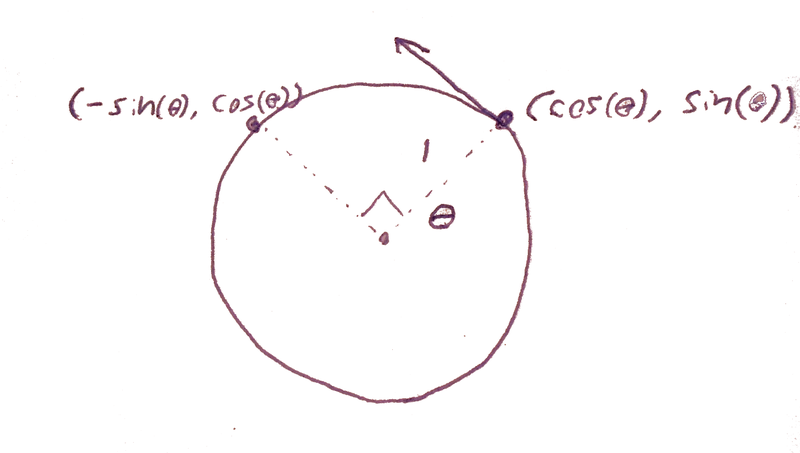 If your having trouble following, focus on the underlying idea: If you walk around a circle with a radius of one meter, at a speed of one meter a second, you are walking tangent to the circle (and, get this, your speed is one meter a second!). If you imagine this as an arrow pointing out from the center of the circle, it lands on the circle a quarter turn ahead of you. And thats it for the post! We just went through about a third of a high school calculus course, and you knew it all! In the next post, I will introduce an alternative way to look at derivatives, differential forms, in light of which the remaining rules of differentiation will become obvious. Please leave a comment below if there was something you couldn’t follow or a question you’d like to ask. I’m far from a perfect author, and my explanations often leave much to be desired. Several of these are mostly written and just need some editing. The first three were originally going to be a single post, but I was persuaded that shorter is better. Regarding whether people already know calculus… I find it difficult to imagine it not being the case. People deal with rates all the time. But I have to admit that I really don’t have much insight into how most people think. Most people aren’t really interested in talking about this kind of stuff with me (even when they want me to help them with their homework, they usually want to finish the problem set, not understand the concept) which leaves me with only my friends to probe, and they aren’t exactly representative of society at large. For now, I’m going to stick with my claim. I certainly think it is true for the large majority of the population. And if nothing else, it’s an awesome title! This entry was posted on July 31, 2011 at 05:48 and is filed under YAKC. You can follow any responses to this entry through the RSS 2.0 feed. You can leave a response, or trackback from your own site. Is f'(g(x)) the same as f(g(x))’ ? Nope, not quite. f’(g(x)) is the value of (the rate f is changing) at g(x), where as f(g(x))’ is the rate f(g(x)) is changing at x. Thanks for the clarification. It was not clear if the ‘ placement before or after the function arguments was just a stylistic choice. >More generally, the rate at which changes (ie. ) is the rate at which changes at (ie. ) times the rate changes (ie. ). Which will hopefully clarify things. If you could give some more in depth comments on how you found this essay, it would be greatly appreciated. Also you have two obvious errors in the notes, the first is “my explanations often leave ??? to be desired”, somthing has to be left there, generally “much”. Nice entry! +epsilon for using tau. Of course, I thought your was post clear and perfectly intuitive. But the real question is: what would a [poor, miserable] person that doesn’t know calculus make of it? (fg)’=f’g+g’f and (f/g)’=f’g-g’f/g^2? I can think one, but it’s not truly all that clear. I have a very nice one for product rule, in the context of differential forms. And quotient rule follows simply from product rule. > +epsilon for using tau. > what would a [poor, miserable] person that doesn’t know calculus make of it? This is indeed the question. Once I have a few more posts up, I’m going to post this here and there. With luck, I’ll be able to attract a few such people. Is there a syntactical mistake above when you wrote “And, as we agreed, his in-reality speed is those two multiplied: p'(m(t)) * m'(t)”? Didn’t you mean to say his apparent speed? I’m trying to contrast in-movie and in-reality speed. I guess I could also have described it as apparent speed, but then what’s his real speed — the one in the movie? In any case, I don’t see anything grammatically wrong with the way I handled it. Could you be more explicit with where you see the syntax mistake? I’m sorry if I wasn’t explicit enough. Upon reflection what I found confusing was the use of the terms of in-movie speed and in-reality speed. In movie-speed obviously refers to the Bob’s speed when the movie is played back at normal speed and in-reality speed refers to Bob’s speed when the movie is played back at four times normal speed. I would have preferred to use Bob’s apparent speed when the movie is played back at normal speed and Bob’s apparent speed when the movie is played back at four times normal speed. Maybe the terms B1x and B4x could be used.